Crude Oil is believed to be in the late stages of a large basing pattern that started to form early in 2015. We will start by looking at a very long-term chart, which enables us to put recent action into context. Many of you will recall the huge runup in the oil price in 2007 and 2008. Our very long-term 20-year chart reveals that this was the final stage of a parabolic slingshot uptrend, which culminated in a spectacular blowoff move. This was followed by a savage decline of almost apocalyptic proportions that was made worse by the financial crisis of 2008. 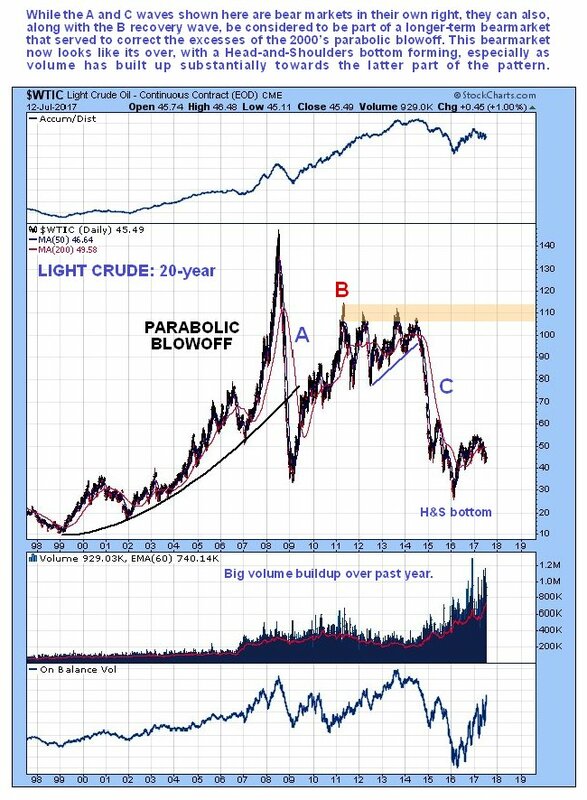 This bearmarket was way overdone and when the economy was stabilized by bailouts and QE etc, the oil price recovered most of the lost ground before moving sideways for 3 years in a big trading range. Then another severe bearmarket set in in 2014 which was partially motivated by the intention of kicking the props out from under the US Fracking boom, by means of crashing the price through overproduction, and this action by Saudi Arabia and other producers was tolerated by the US government because of its desire to damage the Russian economy, which is heavily dependent on oil revenues. Both these objectives were achieved, although the Russian economy has proven to be more resilient than the US Fracking oil boom. After a severe decline, the price showed the first signs of bottoming early in 2015, before another heavy drop to hit a final low earlier in 2016. After the recovery rally last year, it now looks like a large Head-and-Shoulders bottom is completing, especially as volume has built up substantially over the past 18 months, and we will now look at this suspected basing pattern in more detail on a 5-year chart. On the 5-year chart we can see the suspected complex Head-and-Shoulders bottom pattern that is believed to be completing. It is complex because of the drawn out Right Shoulder which could end up with 2 Shoulders. Supporting the contention that this is a valid Head-and-Shoulders bottom is the marked volume buildup over the past 18 months, as mentioned above, especially as this has taken the On-balance Volume indicator to highs for the entire base pattern. With the price having dropped back in recent months towards support approaching the lows of August a year ago, oil is viewed as being in a general buying area here, and especially on any dip into the support approaching $39 - $40. The only circumstance that would be likely to abort this overall bullish pattern is a general market crash, and while that admittedly is a growing possibility, we only need to turn caution and adopt a defensive posture if it should violate the lows of last August by dropping below $39. On the 6-month chart we can see that the price has been trending lower in recent months back towards the support at what should prove to be the low point of the Right Shoulder of the Head-and-Shoulders bottom. 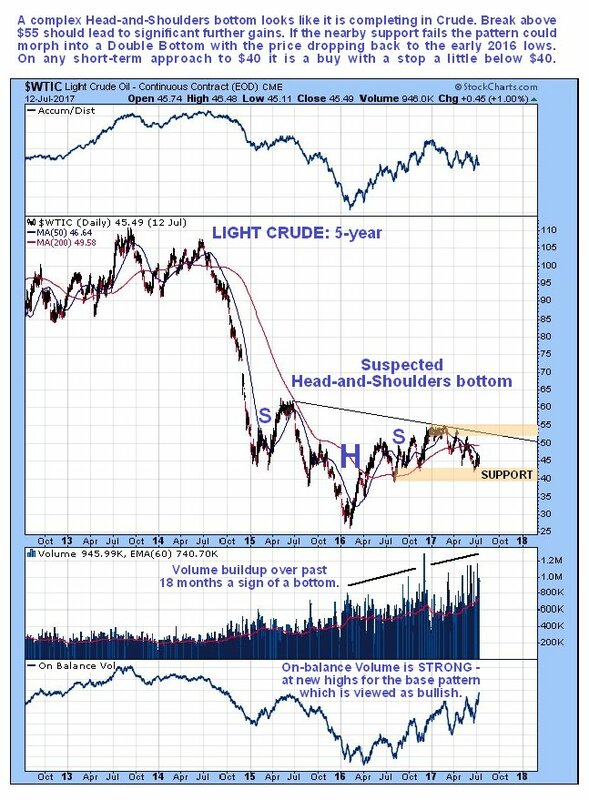 So if the Head-and-Shoulders pattern is genuine and does not abort, this should prove to be a good buying area for oil and for the oil sector. Oil is thus rated a buy anywhere between the current price and the support approaching the low of last August at about $39.30, with a stop below $39, say at $38.70. On the upside, a breakout from the pattern, which would be signified by the price breaking above the resistance approaching $55, should lead to an uptrend and a period of significant further gains. 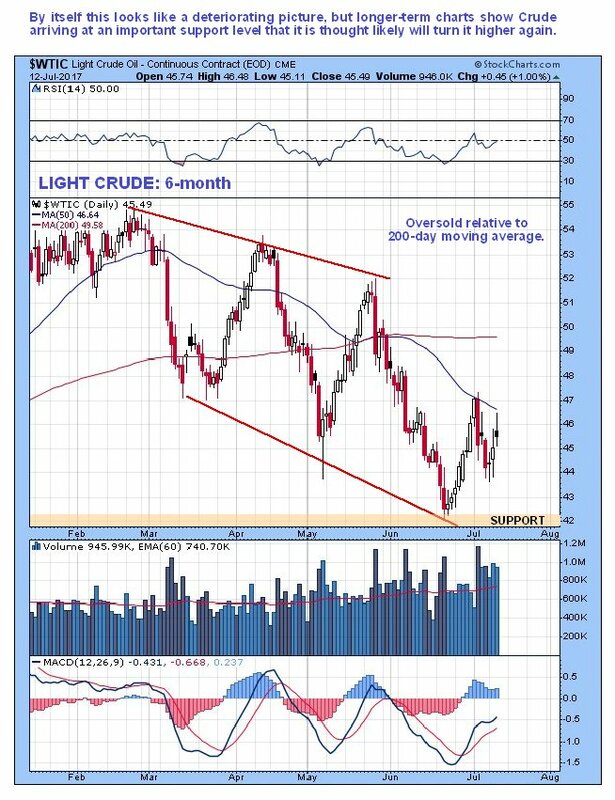 Back at the start of the year oil stocks forewarned of the weakness in Crude by entering a downtrend in January and February. 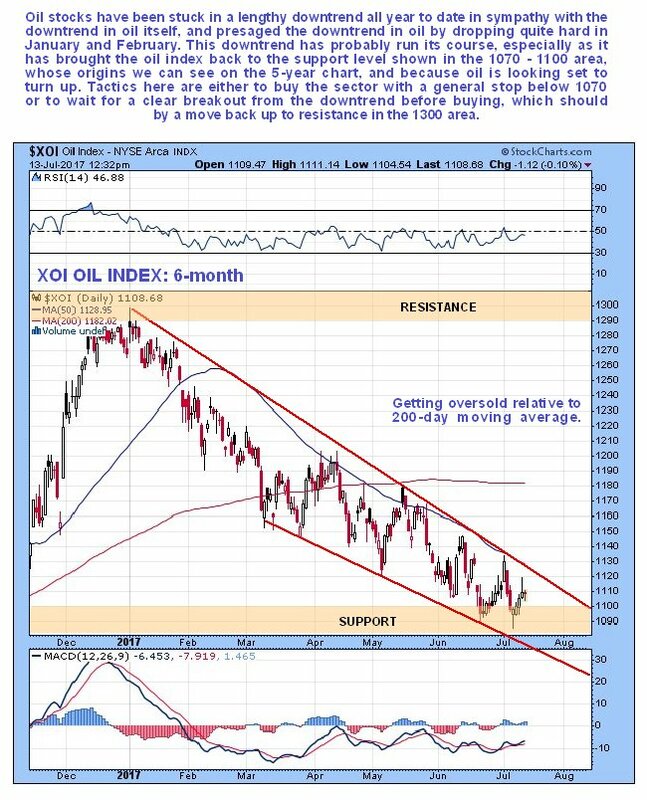 Right now they aren't warning of anything, but as we can see on the 6-month chart for the XOI oil index, they have been stuck in this downtrend for a long time now, over 6-months, and have become rather oversold relative to their 200-day moving average, and since they have now arrived at a support level in the 1070 - 1100 zone, and oil itself is looking set to turn up soon, there is a good chance that they will too. So they are looking like a buy here, especially as there is a favorable risk / reward ratio because the proximity of support means that a stop can be set below 1070 to limit risk in the event of further losses, while the minimum objective if this index breaks out of the downtrend to the upside is the resistance in the 1300 area. 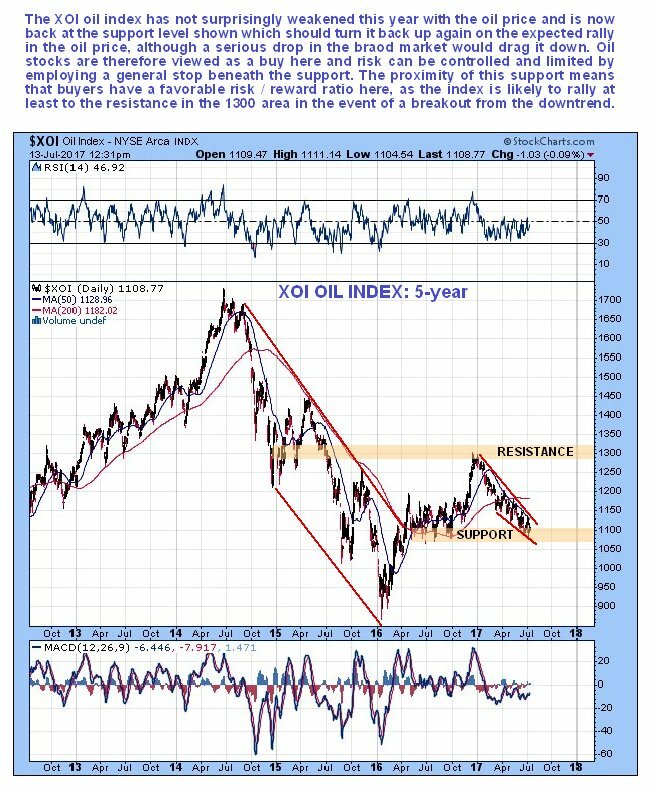 The 5-year chart for the XOI oil index shows the origins of the support in the 1070 - 1100 zone, because it is the level that provided support for the index for many months during 2016. It should turn up here with oil, and only in the event of a serious downturn in the broad market, which is admittedly a growing possibility, is it considered likely that it would crash this support and head lower. Hence the importance of stops beneath this support for anyone long the sector.